OUR FAMILY FRIENDLY GOLF COURSE, DRIVING RANGE AND GYM IS LOCATED IN HILDENBOROUGH, JUST A SHORT DRIVE FROM TONBRIDGE AND TUNBRIDGE WELLS. At Hilden Park we take pride in offering a personal and friendly service, ensuring that visitors of all ages are made to feel welcome. 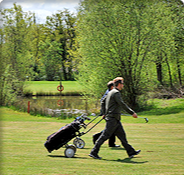 Our 9 hole parkland Golf Course features tree lined fairways and a variety of hazards offering an enjoyable golfing experience to golfers of all abilities. While the golf course is maintained to exacting standards it offers exceptional value. Our gym covers 200 sq meters and incorporates 52 work stations, spin studio and assessment room. Along with our team of Super Trainers, Hilden Park Gym offers a unique personalised service supporting individuals to achieve their personal fitness goals. The fully floodlit Driving Range is equipped with 40 Power Tee bays, premium astro turf targets and quality range balls.